Mayor Jackson presents the Most Generous Bureau trophy to Barry Baker of the City’s Leisure Services Bureau. 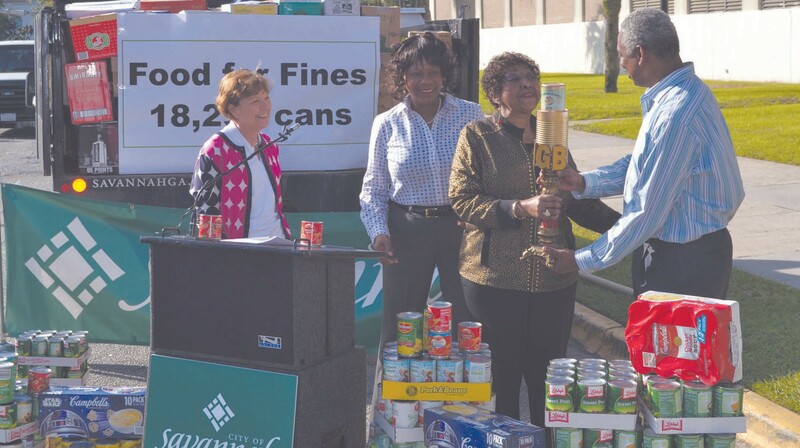 The City of Savannah on Friday donated a record-setting 51,152 cans of food to America’s Second Harvest during the culmination of the Great Savannah Canned Food Drive and the Food for Fines program. The total haul weighed in at 51,061 pounds, which equates to roughly 39,891 meals, said America’s Second Harvest Executive Director Mary Jane Crouch. Canned Food Drive is an annual event that includes a friendly competition among Bureaus within the City organization. This year City employees donated 32,857 cans – a 30 percent increase over last year’s food drive. Mayor Jackson presented the coveted Most Generous Bureau trophy to the Leisure Services Bureau. Each Leisure Services employee donated an average of 17.95 cans during the 10-day collection period. The Most Generous Employee was Lou Smith, also of Leisure Services. He personally donated 340 cans. Leisure Services, led by Bureau Chief Joe Shearouse, includes the departments of Park and Tree, Parks and Recreation, Cemeteries, Cultural Affairs, the Civic Center, Buildings and Electrical Maintenance, and the Film Office. New this year, the City’s Mobility and Parking Services Department launched the Food for Fines program to coincide with the Food Drive. Over the 10-day Food Drive, the City waived one parking ticket in exchange for at least 10 donated canned goods. A total of 1,422 people took advantage of the incentive, donating 18,295 canned goods.